Now Justin likes to move his sculptures into different positions here you can see a position that Justin prefers call the 'dominate position' where the sculpture is laying down & Justin stands over it moving the shaft of the chainsaw in an up & down motion, repeating this until he gets the desired effect. Lastly Justin says that when he's working on his sculptures the advantage of wearing speedo's is that you get a good sun tan, which comes in handy around this time of the year. 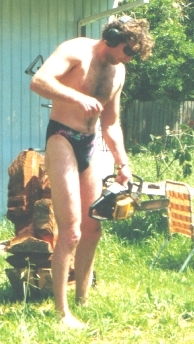 Justin would like to say do not try this at home without the proper experience & children do not play with daddy's chainsaw it is a very dangerous tool & parents please keep your tools in a secure area. Justin prefers to work with soft smooth wood, the type you can just throw around that wont be difficult when it comes to maneuvering the shaft of the chainsaw into position, going in & out. Notice that when Justin starts the chainsaw up that the shaft of the saw is pointed away from his body in an almost straight horizontal position at the central part of his body. 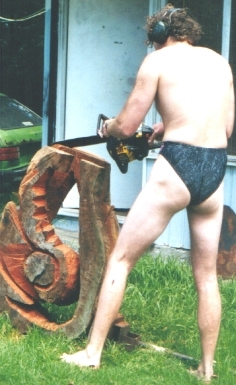 Here you see Justin lightly stoking the sculpture with his saw, pulling it back in a delicate manner. 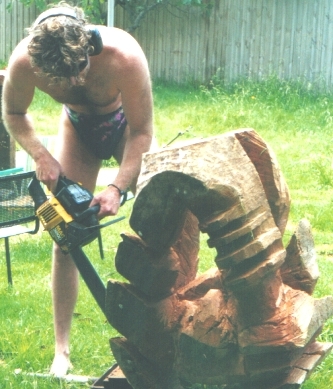 This position Justin calls 'the head down bottom up position', he says this is his favourite position, he likes to start from the top & make his way down manuvering his saw in an agressive manner overcoming any tricky obstacles that may block his saw from entering that desired area of the sculpture.